CIBJO President Gaetano Cavalieri has presented an outline for sustainability in the cultured pearl sector, emphasizing that a comprehensive approach must be taken that addresses economic, environmental and social responsibility. 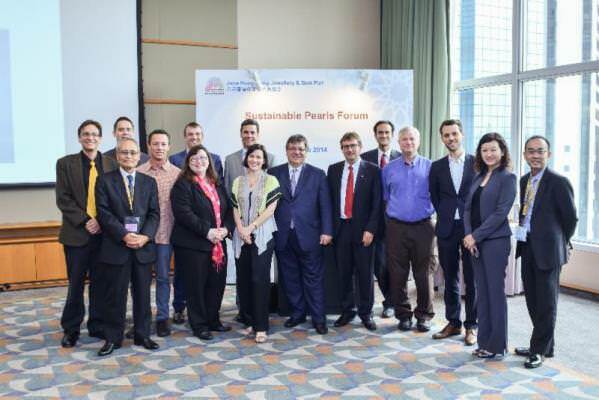 He was speaking at the Sustainable Pearls Forum, which took place in Hong Kong on June 21. Speakers at the Sustainable Pearl Forum in Hong Kong (from left): Douglas McLaurin (Cortez Pearls), Shigeru Akamatsu (Mikimoto), Jacques-Christophe Branellec (Jewelmer), Josh Humbert (Kamoka Pearls), James Paspaley (Paspaley), Julie Nash (Sustainable Pearls & University of Vermont), Andy Hart (Tiffany & Co.), Fiona Solomon (RJC), Gaetano Cavalieri (CIBJO), Michael Krzemnicki (Swiss Gemmological Institute SSEF), Saleem Ali (Sustainable Pearls & University of Queensland), Kent Carpenter (Old Dominion University), Laurent Cartier (Sustainable Pearls & University of Basel), Louisa Ho (The Nature Conservancy) and David Wong (Fukui). The cultured pearl industry provides an opportunity to introduce concepts that often cannot be considered in other sectors of the jewellery industry, Dr. Cavalieri said, because while gemstone mining and mineral mining are inherently unsustainable, in that once gems and minerals have been removed from the earth they cannot be returned, pearls are sustainable, "because we possess the means and knowledge to initiate the natural growth of new products within an economically viable period of time." "From a business perspective it offers the cultured pearl industry a tremendous opportunity," he said, "but along with that comes responsibility." The three basic elements that need to be addressed - economic sustainability, environmental sustainability, and social sustainability, which Dr. Cavalieri described as "stakeholder or community sustainability"- are not mutually exclusive, he said. "The inability to address any one of those elements will make it difficult, if not impossible to address the other two, certainly over the long term." Economic sustainability requires us to use our resources in an efficient and responsible way, so that our business will function profitably over the long-term, he stated. "The essential importance of economic sustainability must be appreciated by the business community, which needs be prepared to take a long-term approach, sometimes at the expense of short-term profit. It also needs to be appreciated by government regulators, who must do their utmost to protect their country’s natural environment and social fabric, while at the same ensuring that the economy is allowed to function," he added. Environmental sustainability should be a catchphrase of the cultured pearl industry, Dr. Cavalieri stressed. "When a consumer buys an item of pearl jewellery, they should feel that they have invested in our planet’s long-term survival, rather than having taken advantage of it," he stated. Referring to stakeholder, community or social sustainability, Dr. Cavalieri noted that because cultured pearls represent a sustainable or renewable activity, members of the grass-roots communities associated with the industry can be expected to remain actively involved for generations to come. "It, therefore, is important that these communities be provided with fair and equitable opportunities to benefit from the pearl farming enterprise, so that they will be incentivized to invest and reinvest in their future and that of the entire pearl industry," he said. As a case study, Dr. Cavalieri mentioned Tahitian Cultured Pearl industry in French Polynesia, which between 1995 and 2012 saw the average value of its product fall almost 80 percent. Larger, more corporate Tahitian pearl farmers were able to operate successfully, he pointed out, but the family-owned farms operating at the grass roots of the industry, which receive only a very small share of the added value of the pearls that they themselves produce, are chronically under-financed, meaning that they lack the ability to invest the time and money necessary to achieve the full potential of their marine concessions. "Successful pearl farming is the result of careful and responsible maintenance of both oysters and the aquatic environment in which they are kept, as well as time provided to allow the nacre to develop," Dr. Cavalieri said. "But many of French Polynesia’s family-owned farms felt they could do neither. With profit margins so low, they tried to compensate with increased production, and the result was lower-quality products and still lower prices. Pearl farms closed, and thousands of workers lost their jobs. A lack of economic sustainability threated both environmental sustainability and stakeholder or community sustainability." Dr. Cavalieri also addressed the possibility of a Universal Pearl Grading System, which currently is being considered by the CIBJO Pearl Commission. "We realize that it is not an easy task, and that a variety of opinion exists. It will take time. But we are patient, and believe that such system will enhance transparency, and, as a consequence, consumer confidence. And let me remind you, to operate a sustainable industry, or any business enterprise, consumer confidence is an absolute prerequisite," he said.